You see, 15 minutes before I arrived, the electricity left the building. It’s a week before AKA puts on Orchestra on the Square, an hour-and-a-half of him performing his music with an orchestra, at Sun Arena inside Pretoria’s Time Square. It’s also a few minutes before he is scheduled to arrive for rehearsal and Nhlanhla is trying to get gwap for a generator. This is the first time the artist whose real name is Kiernan Forbes is going to hear what the orchestra and his band have been working on. Nhlanhla, who sports the Touch My Blood album merch t-shirt where AKA’s kid, Kairo, is side-eyeing everyone, returns from a call. I spot some side-eyes from the crew. Everyone is in agreement: R8000 is way too much to pay to hire a generator for a few hours. I sit in the rehearsal room while the 30-piece orchestra continues inside and the band continues to make a plan outside. I can’t make out some of the songs they are playing. The hit single is given a serious, dramatic flair – like in the movies, when someone is running from the shadowy unknown. In the back of the room, in bold, is the sentence: “Where words fail, music speaks”. I’m a little worried that this music is saying the songs have no soul. Later, once AKA is in the building, I ask him if he was concerned working with an orchestra would strip his songs of their soul? The band members are all smiles when they file into the room. AKA is yet to arrive and the orchestra is taking a break when a steady buzz fills the room. They’ve solved the electricity problem and are running a line from a nearby building. Once the break is over, the band means business. The drummer counts everyone in and ‘Sim Dope’ starts. The band and orchestra merge to create a burgeoning bed of music. It’s so powerful that it feels like the roles syncopate. 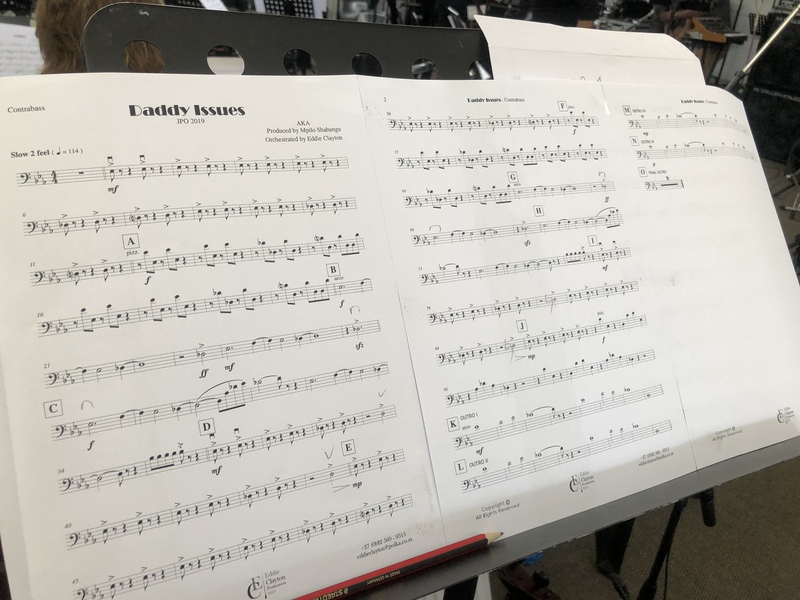 The orchestra complements the band so beautifully that ‘Congratulate’ comes out strong, ‘Caiphus Song’ is swaggy and ‘Daddy Issues’ sounds dope! A woman who plays the double bass shimmies her shoulders when they play ‘10 Fingers’ and it’s striking because of how serious and stiff the bodies of the musicians were before the band joined them. Now, it’s a party. AKA is impressed with the music and pretty soon, he’s left the mic stand and holds the mic in his hand as he sings to the wall, raps with his back to the orchestra and his face to the band and dances during rehearsal. He traverses tracks he’s featured on and solo work. From gqom to early rap to current pop, over a decade’s worth of joints. When they take a break, the energy in the room is… electric. He’s being silly and isn’t completely horrible at picking the guitar but AKA is not about to quit being AKA any time soon. In fact, working on this show seems to be a causing him to reflect on how far he’s come since he started as the lanky third of a hip hop group called Entity. The disappointment in their faces could tug at more (heart)strings than the ones in a rehearsal room full of violins and cellos. “Come, come,” AKA says as he waves them over. He grins at them and then greets them then puts his arm around the first boy and his friend snaps a picture. As the friend takes more snaps for safety, AKA is still answering my question. He wonders aloud if he should add ‘The Saga’ featuring Anatii, to Sunday’s set. And they say men can’t multitask. I ask him if selecting songs from the catalogue has had any surprises. The friends swap places and AKA smiles for the cellphone but in between that, he answers the question. “It’s nice to look back at how far we’ve come and when I listen to some of the songs I’ve made, it takes me back to the times I made them. Where my life was back then because life is at such a different point now,” he tells me. He daps the friends and they walk away grinning. The orchestra takes short breaks – seven and a half minutes for this one – and soon, it’s time to go back in to finish rehearsal. Before we do, something strikes me: AKA goes live on social media to let fans into this room frequently during rehearsal. Is that not revealing how the magician performs the tricks?